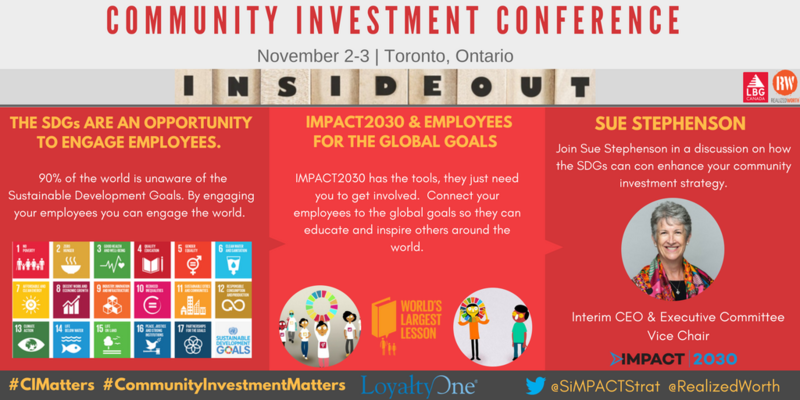 TORONTO, October 17, 2017 /3BL Media/ - Sue Stephenson, Interim CEO and Executive Committee Vice Chair of IMPACT2030, will speak to "Why the SDGs are an Opportunity to Engage Employees" at the upcoming Toronto conference Inside Out: A Transformative Approach to Community Investment. Inside Out is a future-looking conference designed to advance the practice of how companies invest in community. As many companies today are seeking ROI through community investment, participants of the conference will have the opportunity to explore how business priorities such as diversity and inclusion, employee wellness, and employee engagement can be advanced through community investment. The design-thinking approach offered by Inside Out will provide attendees with the skills and knowledge needed to advance their impact: in community, upon employees, and ultimately throughout the entirety of their companies or organizations. "Inside Out is designed for companies seeking to impact community," says Stephanie Robertson, CEO & Founder of SiMPACT Strategy Group. "This way of thinking encourages companies to focus the skills, talents and ambitions of employees on opportunities that have greater community impact. The creativity and structure of design-thinking can be invaluable in achieving that objective." Sue Stephenson’s discussion on "Why the SDGs are an Opportunity to Engage Employees" will explore how you can engage your employees in the sustainable development goals and in turn enhance your own community investment strategy. Her discussion will focus on IMPACT2030’s “Employees for the Global Goals” program; a project that connects employees to the SDGs by providing them with the tools and knowledge to educate others on the SDGs.